Looking for an honest garage that can provide car body repairs in Morley? Sick of getting lowballed on your estimate to find out the invoice is much higher than expected due to “unforeseen costs”? Don’t have a day to bring in your vehicle and sit around the shop all day? Car Cosmetics is a full-service auto body repair shop serving Morley and surrounding areas. Take advantage of our mobile fleet of Morley car body repair shops allowing us to fix your vehicle at your home or place of work. We’ll show up, fix the problems, and let you know when it’s done – no waiting or driving on your part! 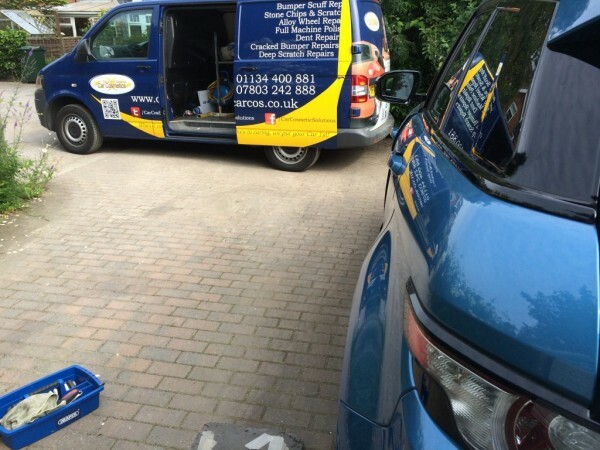 The services we offer for both our mobile and in-garage car body repairs in Morley vary from your typical paint fill in, dent removal, alloy wheel refurbishments and panel replacements all the way to specialty services like hydrographic dipping. We can effectively take care of even the most extreme damage done to a vehicle whether it happened bumping up against a curb or a full on collision. Residents of Morley have been using Car Cosmetics as their most trusted mobile auto body repair specialists for years now; it’s time you find out why! Below we’ve listed some of our other services. Wing mirrors are very common to damage as they stick out from your vehicle making them susceptible to sideswiping posts, walls and other vehicle mirrors. People often will bump your mirror with their door while exiting the vehicle in a car park, chipping or breaking your mirror. It’s important to keep these mirrors in good shape to enable you to see approaching vehicles on either side of your vehicle. We offer wing mirror repairs at low prices whether it’s a new mirror shell or just a paint touchup and everything in between. We can offer multiple solutions to getting your wing mirror fixed to accommodate for any budget, too. As your vehicle ages and is exposed to the elements, your paint will change color and fade out slightly. This is accelerated in vehicles which are parked outside a majority of the time; however, simply driving any vehicle exposes it to sunlight even if it’s primarily garage-kept. Our paint matching experts are able to effectively concoct the perfect colour match for your vehicle even if it’s an exotic paint style. We have experience with all spectrums and styles of colours so you’ll never be able to tell the spot was repaired in the first place. Give us a call and let our work speak for itself prior to finding another paint matching company to handle your vehicle. A poorly done colour matching job can make minor damage stand out significantly and look worse than a simple nick or scratch did in the first place, so leave it to Car Cosmetics – the professional car body repairs in Morley. Our matching services are done at a very affordable price as well. Nothing is more annoying than coming out to your car and seeing a nasty deep scratch in your perfect paint job. When the scratches are so deep they get to the body of the vehicle, or even scratch in to the metal or plastic, extra care is required to properly repair the spot. You can’t simply fill in a deep scratch with touch up paint and have it come out looking decent. We will completely remove the scratch and build the layers back up, mix up the correct colour match, spray and clear coat the whole area and polish the to ensure your vehicle is back up to where it was or in most cases better, before the nasty incident occurred. We offer a variety of other car body repairs in Morley and look forward to working with you on your vehicle. We pride ourselves in our professional level of work and expertise in all things auto body repair. We’ll provide you a quote over the phone and can schedule a mobile repair vehicle to be out to you in no time at all. Don’t let a little scratch or scuff bring you down – call Car Cosmetics today! Fill out the form below for any type of car body repair in Morley.